In a world roiled continuously by earthquakes, volcanoes, and other tectonic disasters large and small, a cataclysmic earthquake is about to change the course of human history… again. On the same day, a woman comes home to find her son dead, killed by his father for being an “orogene,” one of the few people in the world with strange powers to manipulate geophysics to start—and stop—these disasters. Thus begins The Fifth Season, the first book of N.K. Jemisin’s triple Hugo-winning Broken Earth trilogy, and this winter’s SciFri Book Club pick. Join Ira and the team as we ponder seismology, volcanology, and how societies respond to disaster. We’ll read the book and discuss until mid-February. Grab a copy of the book and start reading! Powell’s Books is offering discounted copies. What’s the best way to celebrate this book club? With a voyage to a volcano, of course! Join us in NYC on February 18 at Caveat for a night with volcanologists and author N.K. Jemisin herself as they guide us through an evening of quakes, shakes, and geologic events. Take part in our wrap-up discussion of the Book Club by calling in to the broadcast on Friday, February 15. We’ll be discussing the book with our special guest readers, seismologist Lucy Jones and sociologist Lori Peek. Join the SciFri Book Club Facebook group! We’ll be continuing our discussion about the book throughout the week, and go a little more in-depth than we have the time to do on the radio or in the newsletter. Each week, chief bookworm Christie Taylor will post a discussion question and invite you to contribute your thoughts. Can’t wait to join the conversation? Join the #SciFriBookClub discussion on Twitter, email a voice memo to voices@sciencefriday.com, or call us up and leave a voicemail! Right now, we want to know what you’ve been thinking about as you read the book. Give us a ring at 567-243-2456. Your comments may be played on the air. Keep checking back here over the next four weeks! There’s much more to come. Author N.K. Jemisin on writing the fantastic in today’s world. Are you a teachers looking for some seriously seismic classroom activities? 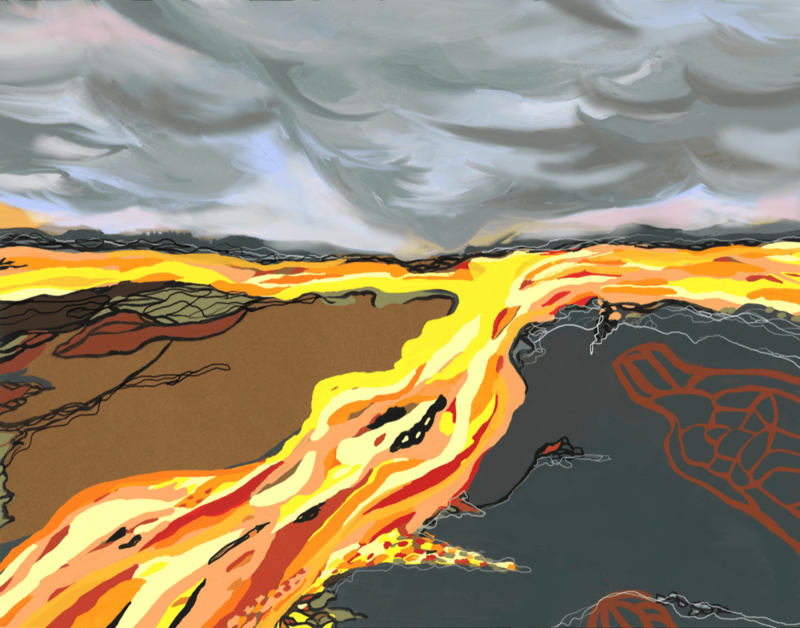 Check out these resources on different types of volcanic eruptions and linear equations to see if you, a car, Usain Bolt, or a tortoise could survive by simply running away, and how to design with disaster relief in mind. Questions about the Club? Post ‘em in the comments below or email bookclub@sciencefriday.com. Happy reading! IRA FLATOW: Now the holidays are long gone and the long, cold winter continues, a bit quieter, maybe a little less hectic, a little ripe for cabin fever, maybe. Well, what a better way to pass the time than to curl up with a good book about the end of the world. Yes, it’s that time again. The SciFri Book Club is back in action. And here to explain what’s up this winter, give us our reading assignments, and tell us how to participate, producer Christie Taylor, our chief bookworm. Hi there, Christie. CHRISTIE TAYLOR: Hey, Ira. How’s it going? IRA FLATOW: OK. What’s going on with the cup? CHRISTIE TAYLOR: Well, you know, we try to alternate fiction and nonfiction when we do our twice a year book club. So this time it’s a work of fiction. Our book is NK Jemisin’s apocalyptic fantasy, or maybe it’s science fiction. It’s called The Fifth Season. IRA FLATOW: The Fifth Season. Why The Fifth Season? CHRISTIE TAYLOR: So in this book, a fifth season is any time anything happens. When you have a volcano where you have ash maybe blotting out the sun and causing a winter-type effect, or an earthquake, or something else that otherwise disrupts society for a long period of time. Which, in this world, happens a lot. So we were lucky enough, actually, to have NK on the show two years ago to talk about writing this book. Here’s how she describes the world that this story is set in. NK JEMISIN: It’s kind of a society of preppers. They have built their entire culture around the idea of trying to survive the apocalypse again and again and again. And there are forces at work in this world– possibly magic, possibly science– which allow some people to stop and start earthquakes and to possibly save or make worse the apocalypse. CHRISTIE TAYLOR: Yeah. And when she’s talking about people starting and stopping earthquakes, they can really stop and start earthquakes or volcanoes or basically manipulate a lot of the geophysical forces of the earth. But as a result, they’re also pretty widely hated and feared. And you’ll see that plays a huge role in this story, which centers on some of those Orogenes, as they’re called. IRA FLATOW: Now, I know you love science fiction. Why choose this book? I also think there’s something really compelling as a climate analogy in here in some ways. You have planetary-scale disasters, but you also have a society that’s sort of adapted to constant chaos. And sort of had a society that’s built around constant chaos, and they’re dealing with it. So this is sort of an imaginative leap that might be really interesting to follow in a time where we’re thinking about the future of our own planet. I really like that. There’s another reason. Volcanoes are neat to learn about some of that science. CHRISTIE TAYLOR: The planet itself is really interesting, where it’s being framed as the enemy of the people. There’s a lot of subtle geoscience and physics we can learn in this story, and there’s a sociological side. These are people who are constantly living through disasters. What is that like? And for a last plug, here’s just a neat thing NK Jemisin said about what inspired her to write the book in the first place. NK JEMISIN: It’s kind of a society of preppers. They have built their entire culture around the idea of trying to survive the apocalypse again and again and again. And there are forces at work in this world– possibly magic, possibly science– which allows some people to stop and start earthquakes and to possibly save or make worse the apocalypse. CHRISTIE TAYLOR: So as you can see, Ira, there’s a lot of really compelling stuff in there. IRA FLATOW: You know, you got me. I’m excited. I saw a copy lying around the office. I’ve already started reading it. IRA FLATOW: I’m at the chapter two. IRA FLATOW: It’s a great read. CHRISTIE TAYLOR: Yeah. And so now we’re going to start actually beginning the book club part of this. For listeners, we want them to pick up the book. And first things first. You can see everything I’m about to talk about on our website, ScienceFriday.com/bookclub, including an excerpt of the book if you’re not sure and you want to take a sneak peek. And then we are, as usual, giving away 20 free copies thanks to a generous donation from our friends at Powell’s Books. You can enter on our web page by Monday midday and that’s at ScienceFriday.com/bookclub. And even if you don’t win, Powell’s is selling The Fifth Season at a 20% discount through the end of February. IRA FLATOW: Now, this is Science Friday from WNYC Studios. Talking about our book club with Christie Taylor. So we’ll read the book. This is a book club. And when do we get to talk about it? CHRISTIE TAYLOR: Well, we can start right now, Ira. We’re going to be discussing the book in a few different forums over the next four weeks, including our new Facebook group– we’re trying that out– Twitter, and, of course, our weekly book club newsletter straight to your inbox. And all of this culminates in an on-air discussion on February 15th, with you Ira, me, and we have two special guests. IRA FLATOW: Do we know who the guests are yet? CHRISTIE TAYLOR: Yeah. I’m really excited about this, as maybe you can hear. Dr. Lucy Jones, who is a world-renowned seismologist, most recently the author of The Big Ones. She’ll be one of our guests. She’s been on our show before. The other is Dr. Lori Peek, who directs the Natural Hazards Center at the University of Colorado in Boulder. She’s written tons about the intersection of society and disasters, and I’m excited to meet her on our airwaves. IRA FLATOW: I’ll bet you are. Any other ways people can get involved? CHRISTIE TAYLOR: Heck, yeah. We are also throwing a volcano party for our New York listeners with guest vulcanologists, we’ll have hands-on activities, and NK Jemisin herself is going to be coming. CHRISTIE TAYLOR: Yeah. And so there’ll be more details out about that. That’s coming in February at Caveat in New York. And then lastly, this is a book with some adult themes and content. But if you’re a teacher and you want to get your students excited about geosciences in general, we have a ton of educational resources from our great education team also on our website at ScienceFriday.com/bookclub. IRA FLATOW: And, of course, we’re going to wrap up with a big roundtable discussion. That’s going to be on February 15th with Lucy Jones and Lori Peek. Any discussion questions I should be ready to think about? Give me my homework assignment. CHRISTIE TAYLOR: Sure, Ira. I’m actually going to let NK Jemisin answer that one for you. I already alluded to this a bit, but let’s just say that even though the science in this story seems like it might be geoscience, seismology, vulcanology, the various apocalyptic ways that this planet could be erupting. There’s another element that I think is just as worthy of discussion that I really want people to think about, too. Here’s NK Jemisin one last time. NK JEMISIN: Since I was dealing with a society that was responding again and again to these immense extinction-level events, what I was trying to get at is not only how do people react to that constant pressure, but how do they react to the fact that they’ve got a group of people who could help them? And so you’re looking at things like sociology and group dynamics and so forth. And roles, power dynamics– how do people behave under pressure? IRA FLATOW: Hm. Sounds great. CHRISTIE TAYLOR: Yeah. And there’s this whole science to human beings in these extreme crisis scenarios. We’ll be digging into how disaster has shaped society in different societies over time. There’s a volcano connection to Frankenstein and that writing, for example, and we’ll dig into that. We’ll learn a bit more about how people are researching volcanoes around the world. We have a lot of really fun stuff in store. IRA FLATOW: So for people who are just tuning in and say, oh, I missed the book club. Let’s just go with a little thumbnail of what we’re reading and how we’re reading it. CHRISTIE TAYLOR: –in our book club yet. So if you have spoilers already, please keep them to yourself. And then everything you need to know about participating is on our website, ScienceFriday.com/bookclub. We’re giving away books this weekend, and you can enter on our website. Random drawing. We have all sorts of fun activities planned on our website and on our airwaves in the next couple of weeks. We have a really cool piece of art that was created for us to help us sort of tie everything together. And it’s going to be a seismically good time. IRA FLATOW: Mm-hm. And we’re all going to meet back here. CHRISTIE TAYLOR: Please don’t miss it, Ira. IRA FLATOW: I’ll be back in the country by then. I know I’ll be there because it’s always exciting. And this is an award winning fiction read. CHRISTIE TAYLOR: Oh, yeah. I forgot to mention. She won the Hugo for it. IRA FLATOW: Yeah, that’s not chopped liver, as we used to say in New York. CHRISTIE TAYLOR: Well, and the following two books also won the Hugo. So she was actually, I think, the only person to win the Hugo three consecutive years– three years in a row– for this series. So it’s really exciting, and it’s a great story. And I hope everyone enjoys it. IRA FLATOW: Good plane ride trip coming up. Thanks again, Christie. Christie Taylor, SciFri producer and head of our SciFri Book Club. One last thing before we go, just a quick note. As you can probably tell, as I’ve been talking about, I’m going to be heading off for a few weeks vacation to explore Angkor Wat and lots of other sites in Cambodia, Vietnam, Thailand. So John Dankosky is going to be filling my shoes while I’m away. Hope to be sending along a few dispatches from the road. So please, take good care of John while I’m gone. And hopefully I’ll send some stuff back you can listen to. This is a Kindle daily deal today, Saturday January 19th for $2.99. This page, https://www.sciencefriday.com/segments/read-the-fifth-season-with-the-scifri-book-club/ says the discussion is Friday, Feb 18th. Feb 18th isn’t a Friday, is it?